Suggestive rooms with the original architecture of the old medieval castle. Today, the castle is more appealing than ever with its 46 double rooms including, one suite, 11 junior suites, 14 superiors and 20 standard rooms. Each room is different and furnished with unique antique furniture, equipped with all the comforts for a charming and romantic stay. 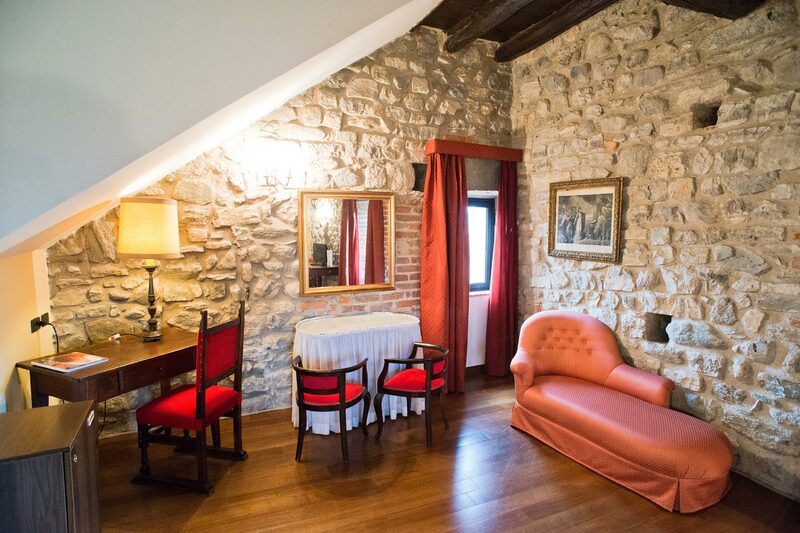 These striking rooms have maintained the original architecture of the medieval castle with architectural elements such as the fair-face stones, wooden beamed ceilings, elegant curtains and stylish furniture. All the rooms offer modern comforts: air conditioning, bathrooms with tubs or showers, hairdryers, satellite TV/LCD, telephone, Internet connection, safe, mini-bar, and room service.